You. Me. Ride This Crazy Train - Adventures and Observations on The GO: Thanks for clearing the platforms, you think you can take a shovel to the benches, too? 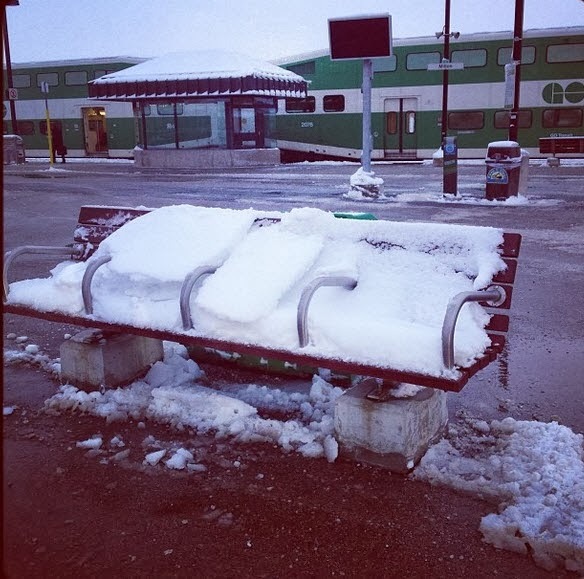 Thanks for clearing the platforms, you think you can take a shovel to the benches, too? Oh but uh, Metrolinx added 160 parking spots at the Oshawa GO Station. Too bad the Milton Station folk can't grab a seat. Priorities, people. Priorities. Your fare dollars at work. That's Frosty crashing after a night out on the town while wating for the next train. He is naked it seems. Sure take the shovel of the bobcat and clear the bench... right out of the ground. Do you think they use the same shovel w3 do on our driveways?? Its just another perch for smokers. You've got benches? Geez, my station doesn't.